My first trip to Kolob was a getaway with my sons Doug, Tom, and Brian. Although that outing was intended to spend time away from home with the boys more than it was a serious fishing trip, I was awed by the geography and saw first hand the size of the trout in the reservoir. We didn’t catch anything other than one little stocked rainbow, but when we moved to the northwestern shoreline at twilight we saw the action up close and personal. For three years I’ve wanted to get back to Kolob for a more intensive assault on those big trout. The foster kids were away at respite, and the Council Meeting day looked like the best opportunity to escape (I didn’t have anything of importance on the agenda, besides Jim and Candy could handle whatever came up). Furthermore, fishing Kolob mid-week on a Wednesday assured small crowds, if any crowds at all. 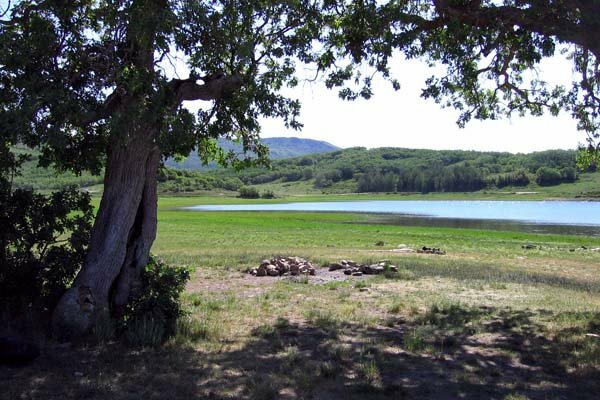 Kolob Reservoir is just north of Zion National Park. 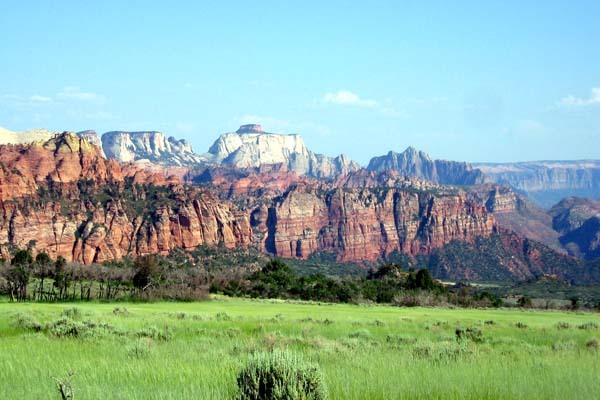 In fact, the Kolob Terrace Road takes you through the northwest section of Zion in the southern portion of the Markagunt Plateau, the headwaters of the Virgin River drainage. 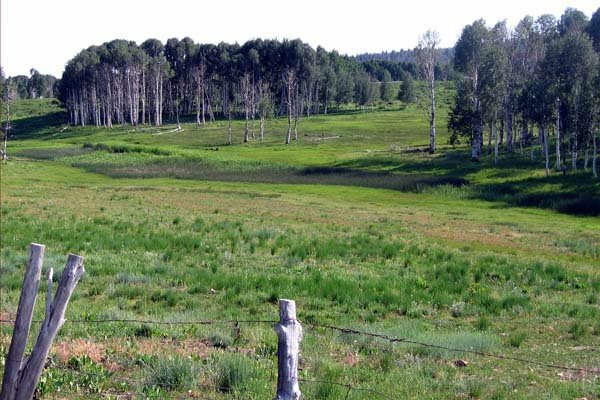 The reservoir sits at 8,100 foot elevation, and at 250 acres it is large for a high-mountain reservoir. It holds rainbow and cutthroat trout, although brookies were stocked in it at one time. I believe they still stock with fingerlings and small trout (I caught two eight-inch cutthroat on this trip), but the holdovers apparently spawn up the feeder stream (which is closed to fishing during the spring spawn). 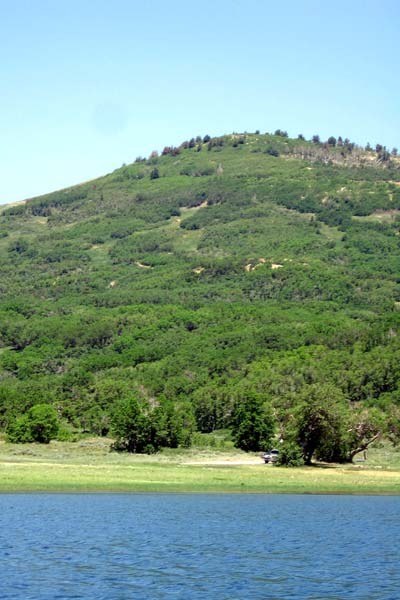 The reservoir is managed by the Washington County Water Conservancy District, which allows the fishery under a cooperative agreement with the Utah Department of Wildlife (UDW). 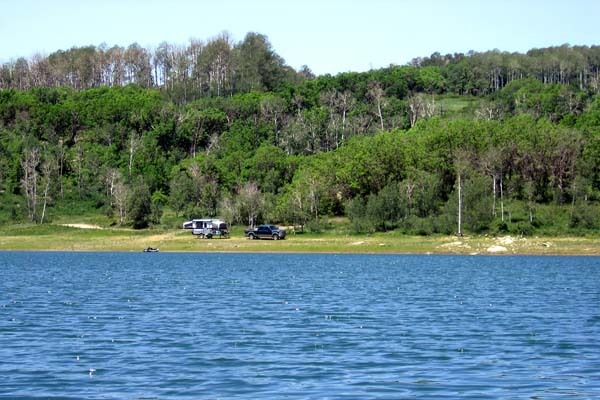 The Conservancy District maintains the reservoir at levels sufficient to support the trout fishery, and has constructed facilities to accommodate recreational use. Golden shiners and crayfish are also present in the reservoir, as evidenced by the crayfish appendage Brian is holding in the June 2005 blog. In 1996 a local sportsmen’s group requested that regulations be changed to promote a "blue ribbon" sport fishery. And so the sport fish management plan developed in 1997 was approved by the UDW and implemented in 1998. The new regulations restrict fishing to artificial flies and lures with a limit of one trout which must be over 18 inches; there’s a clue as to the potential size of these trout. 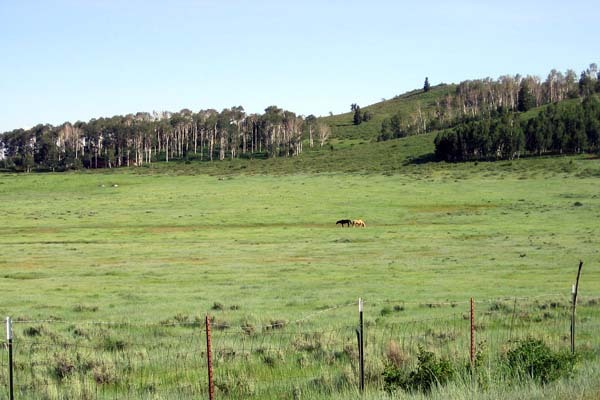 Kolob is not that far of a drive from Las Vegas, about 180 miles one-way, of which 120 miles is on Interstate 15. That’s the good news. The problem is the last 25 miles is on the winding Terrace Road that ascends 4,600 feet from the town of Virgin to the reservoir at 8,100 feet. The road is actually cut up a finger of the plateau and in one stretch you can literally look right or left as you are driving and see nothing but a 200 foot drop on either side… it’s quite impressive. The part of my excursion planning that was faulty was that I was going on a day-trip; I promised Denise I’d be home no later than 9:00pm. This meant that I would fish the warmest part of the day: 10:00am to 4:00pm. 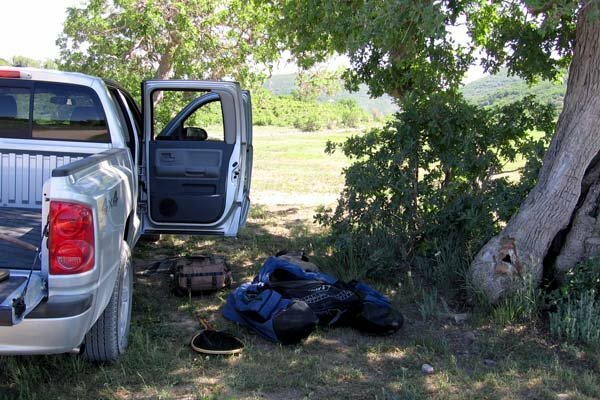 While this schedule allowed for a six-hour round trip, one-hour each for set-up and take-down, as well as a stop in St. George for a bite on the way home, it also resulted in having to fish during the period of the day when the trout would be most lethargic and in deeper water. Still, I had high hopes as Joe from work had fed me good fishing reports, which the UDW web site corroborated. Other than the contractors fixing a drainage problem on the road near the reservoir, the only other person I saw was a pontoon fisherman who was camping next to the reservoir; my plan achieved some semblance of solitude. I parked the truck, assembled the gear, inflated the float tube, and donned my waders and fins. Within an hour I was waddling down to the shoreline. I could tell that the water was lower than the first visit, but still very full. There was no surface activity (as I expected for that time of day), and so I rigged up my nine foot, five weight fly rod with a deep sinking line. I was going to fish medium sized wooly buggers as deep as I could get them. On about my fifth cast I hooked into a pretty sixteen-inch rainbow, which I took as a good omen. From there the fishing slowed down (after all, who can really expect to catch sixteen inch trout on every fifth cast…). After six hours of mid-day fishing my tally was thirty trout hooked with twenty-two actually released at the tube. 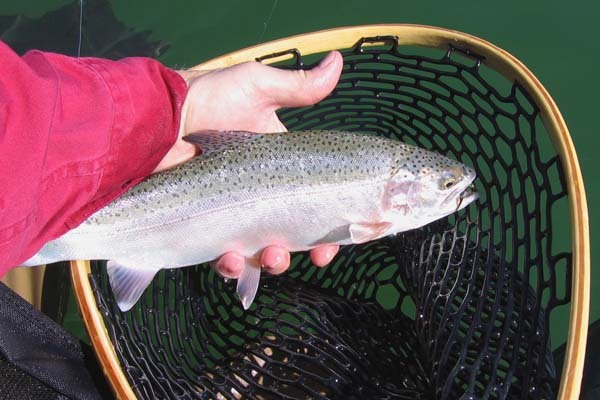 (Trout hooked for ten seconds or so but which “release themselves” by throwing the hook before they are brought to the tube achieve the distinctive statistic of being an LDR… long-distance-release.) 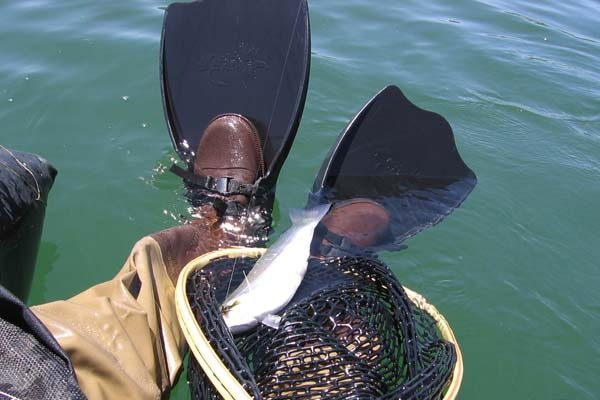 Still, hooking-up every ten minutes on average, and landing a trout every fifteen minutes is very active fishing. Due to that activity, and the fact that the water wasn’t real cold, I stayed out on the water all six hours without taking a break. The portion of the fishing that surprised me, especially after catching the initial large rainbow, was that of the twenty-two fish I landed only six were rainbows. Sixteen of the trout were cutthroat trout. I guess I didn’t realize how plentiful cutthroat were in Kolob. 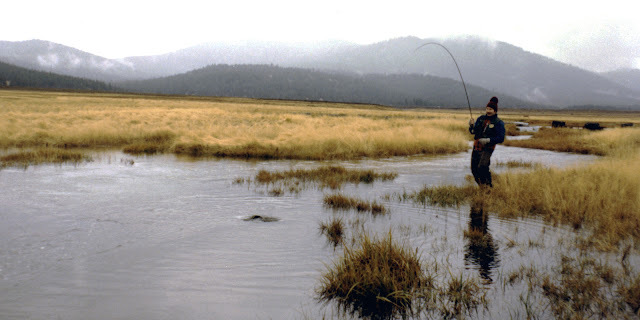 The first cutthroat I ever caught was a Lahontan cutthroat trout near Truckee, California (see my September 1982 Martis Creek blog). I also caught several cutthroats in Mammoth Creek in 1980s, which is not too far from Kolob. All trout are beautiful to me, but each of the main trout species (rainbow, brook, brown, and cutthroat) are distinctively different in coloring, and even in physical appearance. 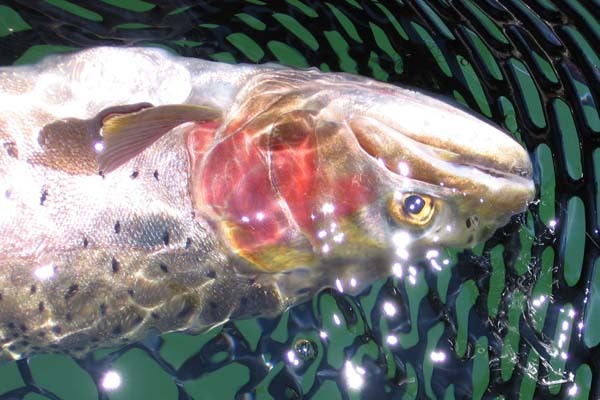 The cutthroat is a close relative to the rainbow, both being western North American natives, but they fight more like browns (European natives) than rainbows. 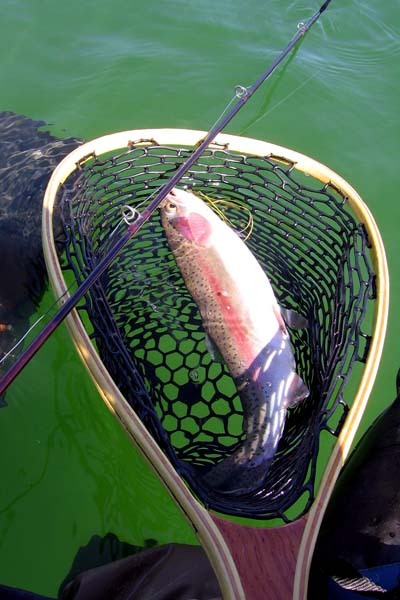 Rainbows are typically more acrobatic and prone to leaps in the air, whereas browns and cutthroats (eastern North American native brook trout, too, for that matter) tend to dive down and fight from the depths, causing them to often “feel” larger initially than they really are, especially in lakes and reservoirs. Once at the surface they tend to thrash and “tail slap” the leader, but rarely jump as a hook-dislodging tactic. 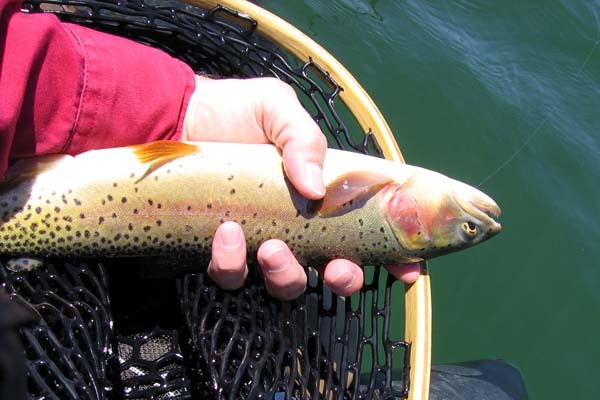 The overall appearance of cutthroats can be more golden, or olive-golden, and so that, too, gives the appearance of a brown trout as they thrash upon the surface. 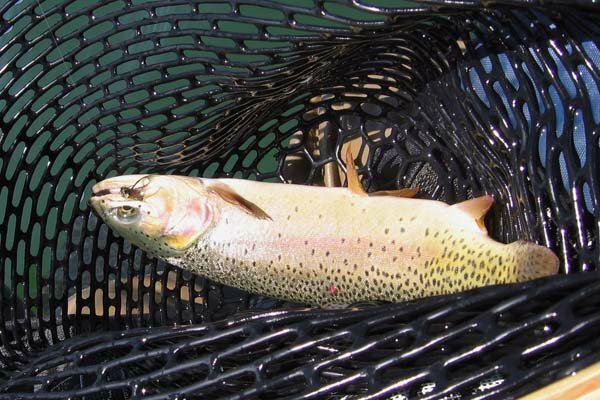 Once they’re in the net there is no mistaking the cutthroat for what it is. Their spots, although similar to rainbows, have the distinct pattern of dense at the tail but sparse at the head. 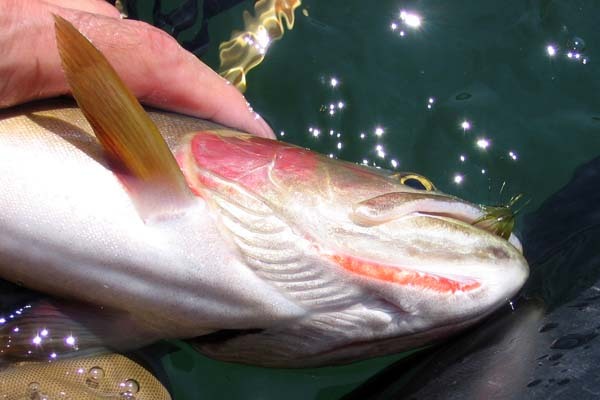 While the younger ones might have a faint crimson slash on their sides (such as what might be found on a stocked rainbow trout), their gill plates are usually very crimson but without any spots at all (often rainbow will have spotting on their crimson gill plates). But then there’s that signature marking, the orange-crimson slash under both sides of the lower jaw, that gives the cutthroat its odd name. The rainbows I landed were in the twelve to fourteen inch range (except for the initial sixteen-incher). There were all plump and acrobatic, although mostly silver except the sixteen-incher. For the most part the cutthroats seemed like carbon copies of each other. 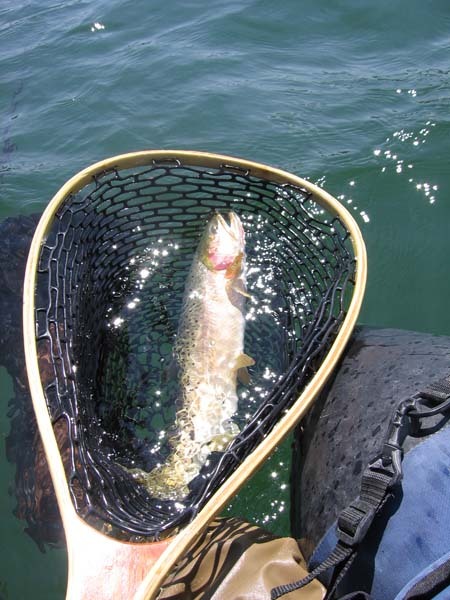 I did catch two that were about eight inches in relatively shallow water, but the other fourteen cutthroats were fifteen to seventeen inches. In fact, I suspect I caught a few seventeen inchers more than once (another characteristic of cutthroats is they are not discriminating eaters; they are easily fooled). Although they were long, they were sleek unlike the plumper rainbows. That’s not to say they were unhealthy or weak; I believe it is more to do with their genetic makeup. Regardless, fishing Kolob was a blast. My only regret was needing to leave before the late afternoon, early evening surface activity (insect hatches usually occur in the cooler parts of the day, which also drives the trout to the surface as well… very exciting for fishing). As I was making my last pass along the north-western shoreline in preparation for my departure, the other fisherman trolled over to me. He was on a pontoon boat with an electric trolling motor mounted on the back. He was passively trolling a fly line with a tandem set of Prince Nymphs on his leader. It looked boring to me: no casting, kick-paddling, or rowing going on. In the course of my six hours he had been on and off the water several times. He waived hello, so I asked him how he was doing. “Not as good as you,” he replied. He asked what I was using and I told him. I added, “The action has been good, but nothing over seventeen inches.” He then remarked that the previous day he landed a three-pound trout (that’s got to be about twenty inches, I should think). Another reason to stay for the evening hatch… Oh well, there’ll be another time. On the way out I stopped at several points along the Terrace Road for quick pictures. I saw several doe mule deer along the road, and I couldn’t resist capturing the scenery because of its dichotomy. Red and white sandstone cliffs, more usually found in the desert, rising up amidst pine and popular creating such a contrast that your eyes can’t avoid drinking it in. 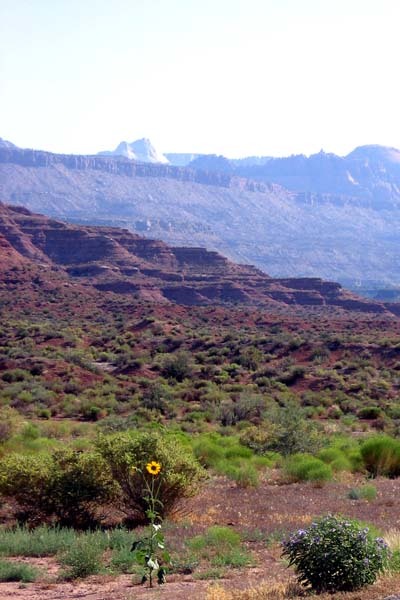 Southern Utah touts itself as the “Color Country”, and for good reason. Sometimes it’s all I can do to sit in awe of God’s creation, from a stupid little cutthroat trout to the grandeur of the Kolob Terrace. Wow! Only that it's a difficult time of year to reach the fish from the shore right now. I suggest a boat or tube. If you will be fishing from shore, waders can get you a little farther out on the inlet side (north) and the northwest side. I'm by no means an expert, but try it early in the morning or late in the afternoon when the temperature is cooler. I would think patterns that can immitate golden shiners or crayfish would also be good. A lot of the cutthroat takes on this recent trip where on the pause of the strip... be ready. Good luck. I hail from a little desert rat oil town in California "Taft"
I am definitely bringing my pontoon boat (no float tube here) and maybe even a canoe for my family. 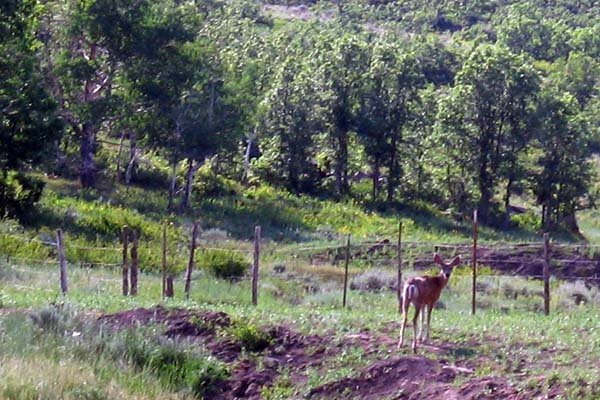 Here's the link to the Utah DoW: http://wildlife.utah.gov/blueribbon/waters/kolob.php. It doesn't mention potable water, but I believe the Water Conservancy made improvements around the boat launch area (southern end by the dam); I believe you could find water there. As a precaution take a 5 gal. jug of potable water with you... that'll last a good while. All the best.